We thought you might be interested in signing up to receive more B2B marketing updates. Need more best practice, guidance and opinion? We take data privacy very seriously and will not share your details. So we can send you information that's relevant to you, please tell us what you'd like to receive. Subscribe to General Communications Adhoc news and announcements via email from CRMT. Subscribe to Insights from CRMT Email content round-ups, hints and tips to help you improve marketing effectiveness. Subscribe to Events and Webinars Adhoc email notifications about upcoming events and webinars. You can update your preferences at any time using our preference centre. No thanks, I'm all set. Welcome to our GDPR Update. 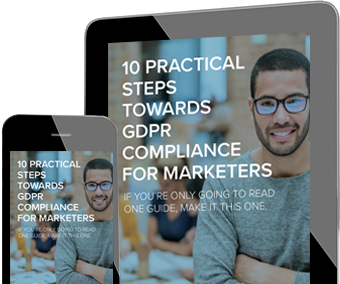 Every month we will be updating you on the latest developments on the General Data Protection Regulation (GDPR), to bring you the latest GDPR news, guidance and opinion for marketers. While there is much in the new regulation that is black and white, there is also much, once you get into the detail, that is as grey as grey can be - open to legal scrutiny, interpretation and ultimately case law so please do consult your legal teams before taking action based on the content of this update. Any doubt whether the UK would adopt GDPR has been removed with the recent Queen’s speech promising that the government would introduce a new data protection law aimed at incorporating the EU regulation with some suggesting it may go even further. Whilst we think 92% is optimistic, we are seeing a definite trend of greater awareness and companies starting to think about a GDPR implementation plan as we get closer to the deadline . Be careful you don’t fall foul of existing data protection laws in the rush to get opt-in consent. B2B - DO I REALLY NEED CONSENT? The issue of consent is one of the hotly debated topics, especially for B2B marketers. Some legal professionals and industry commentators are advising not to go down the consent route – preferring to use “Legitimate Interest” as the legal basis by which you can process prospect and customer data (ie. you have the legitimate interest to grow your business by telling your customers and prospects about your products/services). Others are saying that going down an Opt-In/Consent approach is industry best practice, is good for the Brand and ultimately gives the best customer experience. Some are even saying that each country within Europe will decide whether to relax the rules for B2B resulting in the current country by country approach for B2B. So it’s about as clear as mud then! The ICO in the UK have published draft guidance for Consent that is clear – no distinction between B2C and B2B and two routes for the legal processing of data (Consent or Legitimate Interest) for Direct Marketing. Some of the draft guidance has been challenged by bodies such as the Direct Marketing Association (DMA) and we await the publication of the final guidance later in the summer before some of the confusion can be finally cleared up. We assume that the accompanying ePrivacy Regulation will mirror the Consent requirements within the GDPR for email communication and cookies etc. WILL I CONTINUE TO BE ABLE TO PURCHASE 3RD PARTY DATA? The current draft Consent guidance in the UK from the ICO says that prospects/customers must Consent to their data being passed to a 3rd party for processing and that 3rd party must be explicitly named. This obviously kills off the 3rd party list provider market so not surprisingly the DMA have challenged this in their response to the draft guidance. Again, we will have to wait to see the final guidance before we can be sure which way this will go. Stay tuned for further GDPR updates and insights. Get in touch to let us know how we can help. Contact us today. Adhoc news and announcements via email from CRMT. Email content round-ups, hints and tips to help you improve marketing effectiveness. Adhoc email notifications about upcoming events and webinars.